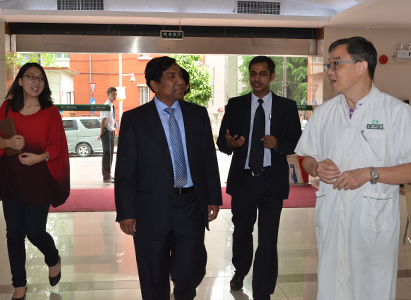 On June 11th, Mr. Al Maruf Khan, the vice president of Bangladesh-Sri Lanka Joint Venture Investment Bank, the TREC member of Dhaka and Chittagong Stock Exchange of CMSL Securities Limited Company, and Dr. Karishma who is responsible for cancer medical project, visited Modern Cancer Hospital Guangzhou. 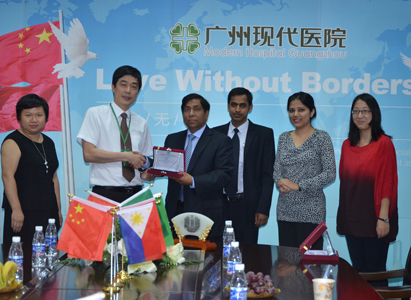 Lin Shaohua, the general manager of MCHG, and Chen Bing, the vice president, warmly received Mr. Maruf and Dr. Karishma. 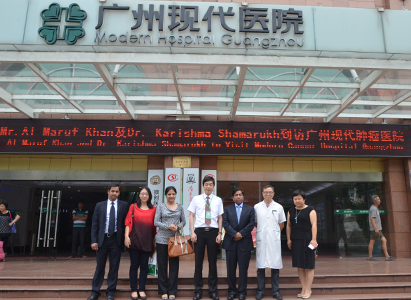 At 10:30 a.m., Mr. Maruf and Dr. Karishma arrived at Modern Cancer Hospital Guangzhou. The leaders of MCHG, including Mr. Lin and Mr. Chen, showed hospitality to them and took a group photo at the main entrance of MCHG. Subsequently, in the conference room of MCHG, Mr. Lin and Mr. Maruf had further discussion. Mr. Lin introduced the condition of MCHG, such as the development of MCHG, technologies, equippment and doctors. After that, Mr. Maruf watched the documentary film about development of MCHG and then he said further understood MCHG. enhance the cooperation between Bangladesh and China. Mr. Lin expressed medical without borders, therefore MCHG was willing to better serve cancer patients in Bangladesh with advanced medical technologies and equipment. Besides, Mr. Lin further talked about the cooperation. After the meeting, on behalf of MCHG, general manager Lin and Mr. Al Maruf Khan exchanged gifts and wished to continue the medical exchange and cooperation in the future. In the afternoon, with the guidance of leaders of MCHG, Mr. Al Maruf Khan and Dr. Karishma visited the overall environment of MCHG. During the visiting, the clean, comfortable and warm environment gave a deep impression on the two guests. It is learned that Mr. Al Maruf Khan and Dr. Karishma visited MCHG to know more about China Boai Medical Group and Modern Cancer Hospital Guangzhou. In such way, Mr. Al Maruf Khan wants to find more medical exchange and cooperation in the future, further improving the cancer treatment between China and Bangladesh. 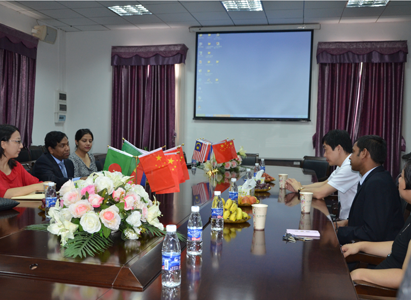 It is understood that Mr. Al Maruf Khan and Dr. Karishma would have further talks with Lin Zhicheng, chairman of China Boai Medical Group.